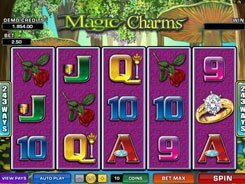 Magic Charms is an enticing 5-reel slot based on a 243 ways to win model and inspired by The Princess and the Frog animated fantasy film. The symbols, fittingly, include a rose, a gold pot, a golden ring, a chest, a key, and a magic wand. These are supplemented by traditional playing card icons from Nine to Ace. 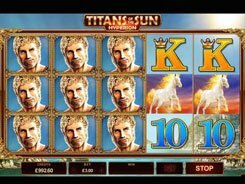 By adjusting a coin size and the number of coins, you can bet from $0.3 to $50 per spin. 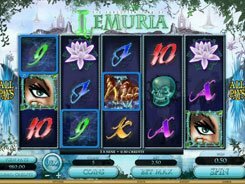 What is amazing about the slot is a host of wild symbols giving you the best possible chances for scoring big. Frog Prince and Princess are wild symbols that substitute for all regular icons. When hitting reels 2 and 4 at the same time, the Frog Prince and Princess extend up and down on their respective reels to cover all three symbol positions. 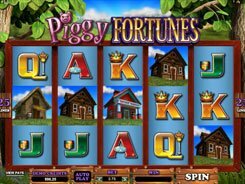 Besides, when on reels 2 and 4, the wilds activate 3 free spins, with those reels staying frozen for the duration of the feature. 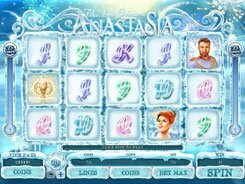 The Magic Wand symbol is a bonus wild that comes stacked and lands on the central reel only. 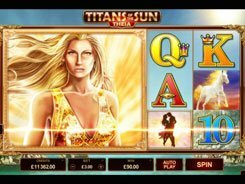 The largest fixed jackpot of x600 times a bet is awarded for five Ring symbols appeared on the adjacent reels starting at the far left reel.